Rating: 3.5 to 4 stars! It’s practically a Royal Marriage. The highly eligible son of Miss Seeton’s old friends Sir George and Lady Colveden has wed the daughter of a French count. Miss Seeton lends her talents to the village scheme to create a quilted ‘Bayeux Tapestry’ of local history, inspired by the wedding. But her intuitive sketches reveal a startlingly different perspective—involving buried Nazi secrets, and links to the mysterious death of a diplomat and to a South American dictator . . . 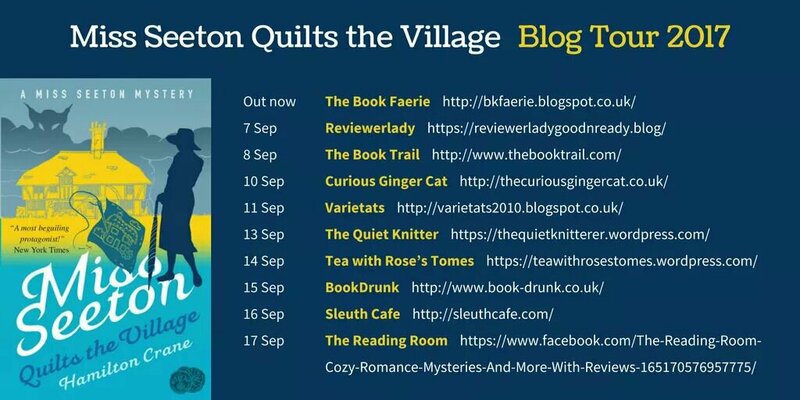 I would like to thank Farrago for giving me a free ebook of Miss Seeton Quilts the Village in exchange for an honest review. 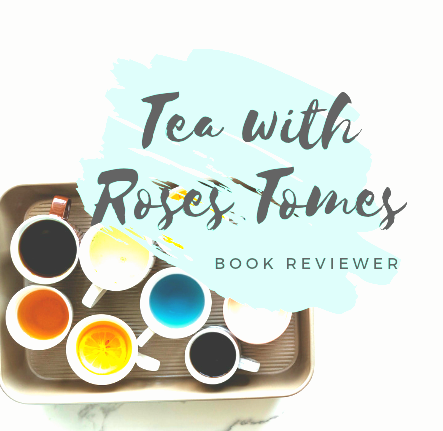 I would like to apologize for my blog tour post is late. I had power outage since Sunday due to storm Irma. 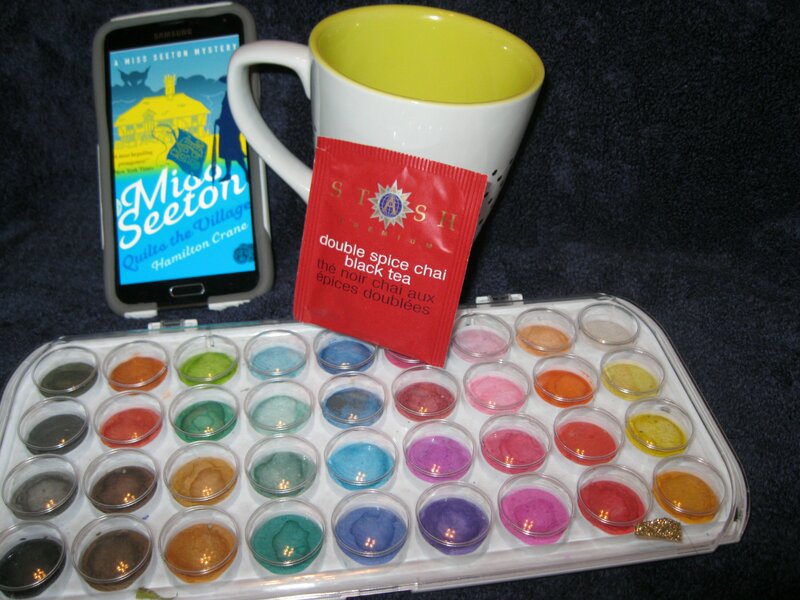 Tea: I was drinking a double spice Chia black tea that was as cozy as this cozy mystery! To me, the beginning was very confusing. I had to reread it a couple of times in order to go forward. I loved the humor & splashes of satire in this cozy mystery! It definitely had a comic relief throughout the book. I mean how could you not love an older woman who can use her PSYCHIC DRAWINGS to aid local police in their crazy investigations. Miss Seeton was a very unique character, I have never personally read anything like her! I love how she is armed with her sketch pad, pencils and of course her trusty as hell umbrella! (: For some reason, Mary Poppins came to mind when I thought of umbrella. The secrets upon secrets! Oh! Can’t forget the gossip that runs wild in the village. The 1970s feel and the British setting was also a pro for this book. The book is filled with plots and sub-plots! Which I like, because it would be utterly boring without it. If you love cozy mysteries, this is has been made for you! Now, if you have never read any Miss Seeton other novels like myself, I would pick up a couple of them to get a feel for the characters and village life. I will definitely be picking up the earlier books then the newest ones! I was conflicted with my rating so it’s a 3.5 because I was lost at moments, and wish I read some of her earlier books. However, I rate it a 4 star for being thoroughly entertaining and a fun light read(: I definitely recommend! Check out the other amazing reviews and book bloggers that share their opinion of this cozy mystery! Previous postThrone Of Glass Tag!